The Char Broil premium electric grill rotisserie review shows it will fit most 3 and 4 burner grills with no problem. It can carry a weight of 20 pound and the meat forks that are included hold up very good. If you are looking to make some finger licking rotisserie chicken on your Char Broil grill this is probably what you are looking for. This rotisserie is not only for chicken, but can be used for a variety of meats like ham, roast and any larger piece of meat. The main advantage of a rotisserie is that the meat will cook very even and the rotation makes that it basically baste itself and keeps the chicken or other meat very moist and not dried out. The dimensions are 39.4 x 5.5 x 3.1 inches. The weight of the unit is 4.5 pounds and it made by the Char Broil company. We always take a good look at the lower ratings to find similarities that we have to mention in our review that are bad and this Char Broil grill rotisserie is no exception. 13% gave the 1 star rating for the reason that either the motor burned out too fast and or because the motor was not strong enough. some of them had to make smaller adjustments to make it fit on their grill and that is why they gave it a 1 star. Others mentioned that it worked good for one season and the next season broke down. 8% 2 star raters and they mentioned that again the motor did not hold up and that the overall quality was disappointing. Some thought it would be more special made for Char Broil, but they mentioned it looked very generic. 9% 3 star ratings mentioned of course that it worked pretty well, but again some remarks about the motor not being to strong. Te rod tends to come out of them motor and then is stops rotating. This could be a installation error. 70% rated the rotisserie with a 4 and 5 star rating. There are extra brackets in the package to install it on other brands that confused some people what to use for their grill. But after reading the manual real good the problems got solved easy. There was some advice that the meat has to be very well balanced and than the unit will last a long time. Several times I read that it would be nice if the speed would be adjustable. I guess there are some problems with this rotisserie that you have to check as soon as it arrives at your house. Make sure it fits your grill because although it says that it will fit it seems that Char Broil makes small changes to their grills and this means that the rotisserie does not fit as easy as they say. 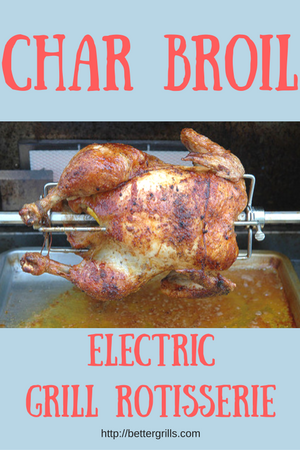 There are still more people who like this electric rotisserie and enjoy all the good food they cook with it. Be aware of the problems and send it back if you have any doubts about the quality. Make sure that you do not overload it and try to keep the meat balanced all over it. This seems to be the key for the best quality meat and makes the motor work more constant and this will prolong the life of the motor. you can read find all our grill accessories in that category at the top of this page.